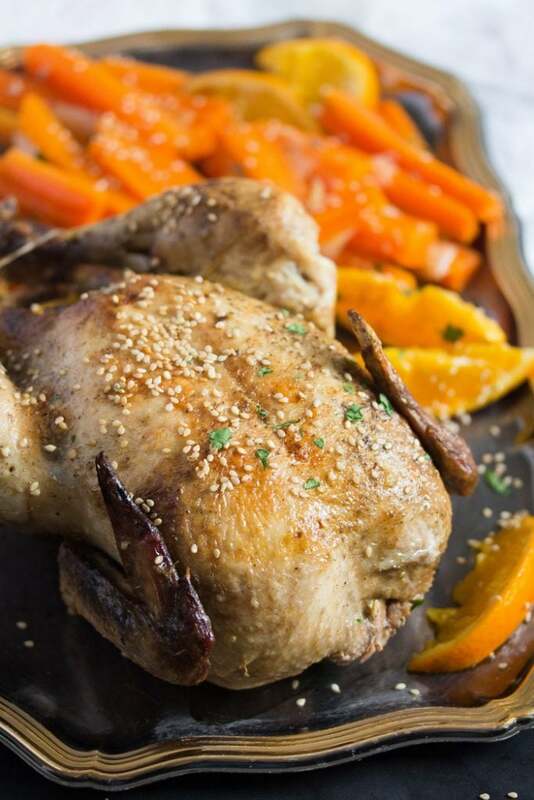 Whole roasted chicken with oranges, carrots and onions, served with a delicious orange gravy. 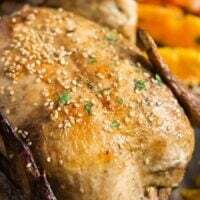 If there is a reason why I could never become a vegetarian, that reason would be chicken… I love chicken in any combination, I like any part of the chicken – breast recipes, thighs or wings – and I do love a whole roasted chicken. 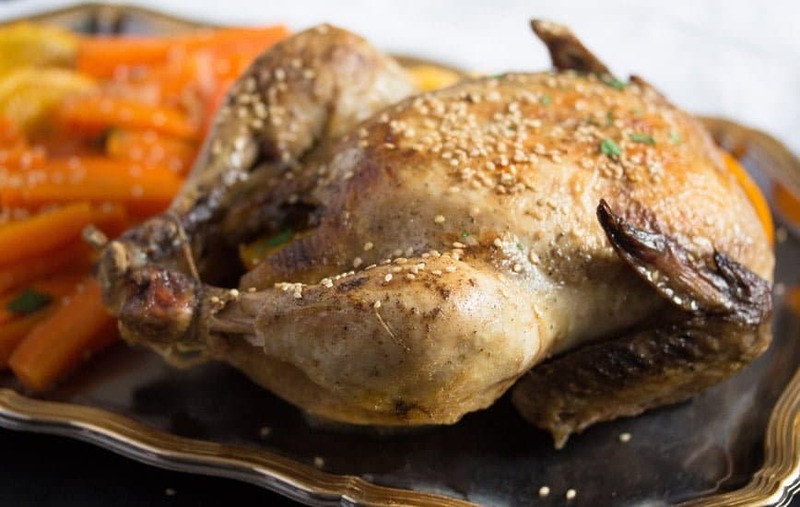 I have never actually had a whole roasted chicken while growing up in Romania, this way of cooking a bird was never very popular there, even chicken breast recipes were not usual in our family, unless they were in form of a schnitzel. It was either a whole bird cut into pieces and roasted or stewed or chicken legs. You really should try my grandmother’s chicken legs with carrots in the oven, they are divine! This recipe for orange roasted chicken is actually the first recipe for a whole chicken I have ever made. It happened more than 10 years ago, before our children were born, it was a recipe found in a magazine during the time we were living in London. This pot roast chicken recipe was so easy to make, a piece of cake even for somebody who had never actually cooked a whole chicken before. And so aromatic and delicious I kept coming back to it over and over again. Over the years that initial recipe developed, it actually became even simpler than it already was. Step 1: Prepare the chicken. Rub it well with salt and pepper on the outside and on the inside. Brown the chicken in a pan first. This step is necessary to give enough color and crunch to the skin. 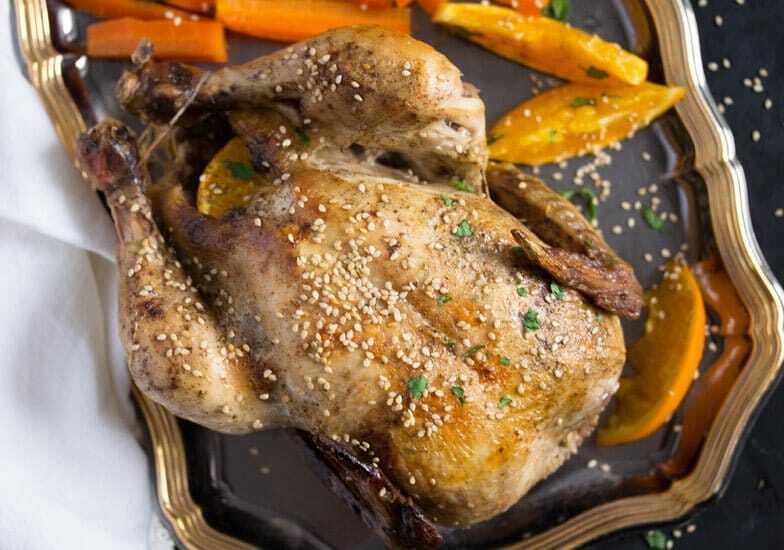 The orange roasted chicken spends most of the time covered in a pot and the last 10 minutes it gets without a lid would not be enough to get that nice golden brown color you are looking for when eating a whole roasted chicken. You can brown the chicken either in the ovenproof pot you will be using later or in a cast iron skillet or a non-stick pan. I prefer the non-stick pan, but it is up to you. When browning the chicken, make sure you turn it on all side. Use tongs for this purpose. Step 2: Prepare the oranges. 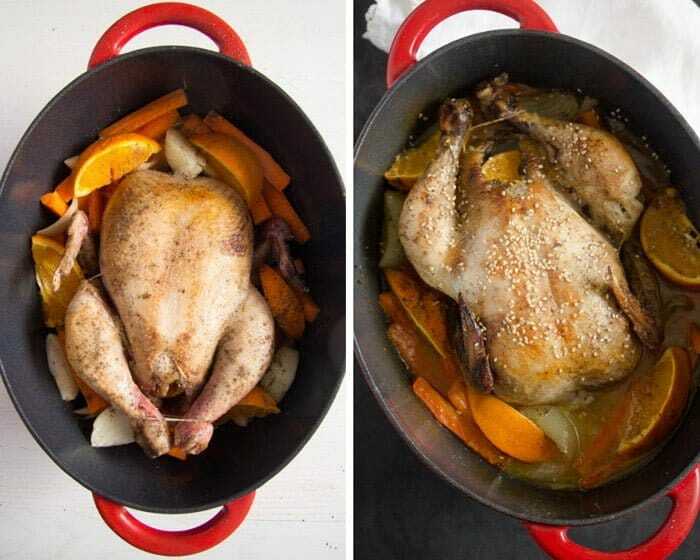 You will need 3 oranges, I always buy organic oranges for this pot roast chicken recipe. Either way, make sure you wash the oranges very well before you use them. Cut one orange in wedges and set aside. The remaining two oranges will be juiced, you will need roughly 150 ml/ 5 fl.oz/ 2/3 cup orange juice, if you don’t have quite enough, top that with some water. Use 2 or 3 of the juiced orange halves to stuff the cavity of the chicken, they (together with the thyme) will flavor the chicken from the inside. Step 3: Prepare the vegetables. You can either use very thin carrots that only need to be cut into 5 cm/ 2 inches long pieces or you can use regular carrots which should be cut into sticks of the same size as mentioned before. Peel and cut two small onions into wedges. Step 4: Assemble the pot roast chicken. Use a pot with a lid or cover the pot well with aluminum foil, if it doesn’t have a lid. Place the browned and stuffed chicken in the pot and arrange the vegetables and the oranges around it. Season the vegetables well with salt and pepper. Add a few more thyme springs. Pour the freshly squeezed orange juice all around the chicken. Step 5: Cook the orange roasted chicken.
. The internal temperature should be of 73 degrees Celsius/ 165 degrees Fahrenheit. The vegetables should be tender as well. 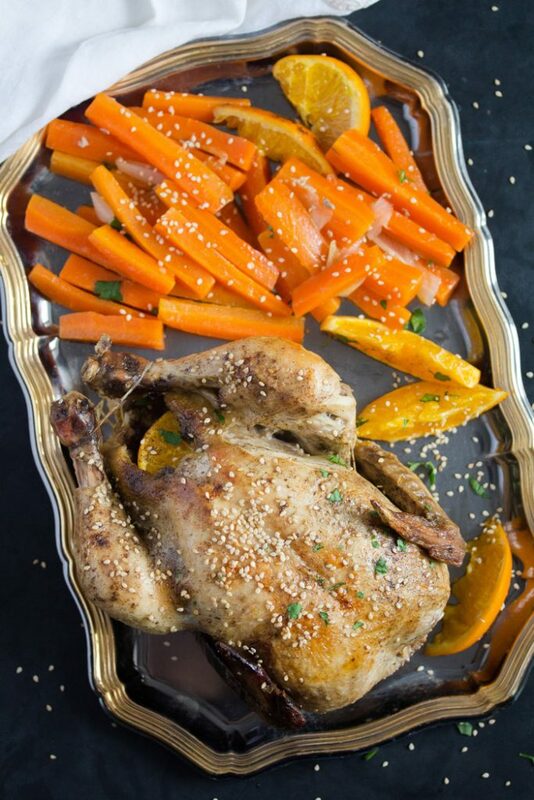 Baste the orange roasted chicken with some of the cooking juices and sprinkle it with the sesame seeds. Return to the oven and cook, uncovered, for further 10 minutes. Transfer the chicken and the vegetables to a serving platter and keep warm. 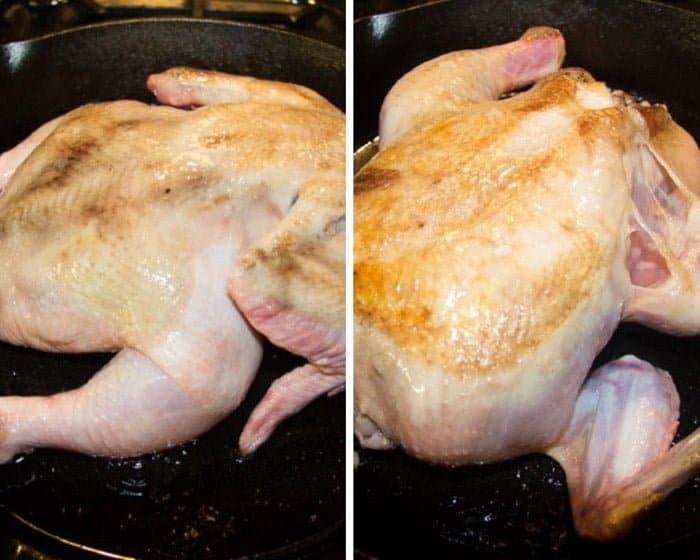 Let the chicken rest for 10-15 minutes before carving. Step 6: Make the sauce. Sieve the juices from the pot into a small pan and bring to a boil. In the meantime whisk together the cornstarch with 1-2 tablespoons cold water until you obtain a thick yet pourable paste. Slowly pour the cornstarch paste into the simmering gravy while whisking continuously. Let bubble once or twice and remove from the heat. Season, if necessary. Let the whole roasted chicken rest for 10-15 minutes before carving. Serve it with the vegetables and oranges from the pot and the orange gravy. Suitable side dishes would be plain rice, roasted potatoes or crusty bread and a green salad. The carcass: Use the carcass to make chicken stock. If you don’t want to make the stock immediately, place the bones in a freezer bag and freeze them until ready to make stock. 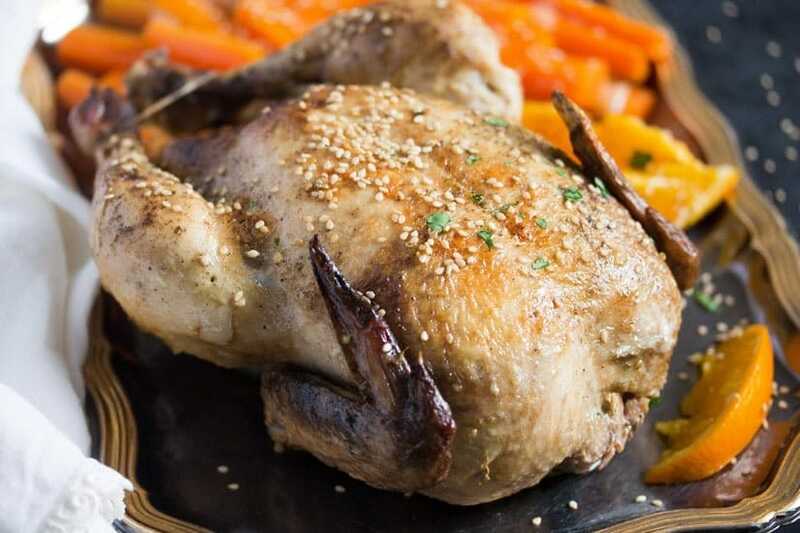 Give the bones to a large pan together with 1 or 2 fresh chicken leg quarters, add two carrots, 1 halved onion, a piece of celeriac or a few celery sticks, some leeks (if you happen to have them), bay leaves, black peppercorns, juniper berries, all spice berries and salt. Cover with water, bring to a boil and simmer uncovered for several hours, at least 3-4. I usually cook my stock for about 10-12 hours, I start it in the morning and turn the heat off when I go to bed. Pat the chicken dry with paper towels. Rub it all over with salt and pepper, including inside the cavity. Heat the oil in a skillet. Fry the chicken, turning it, until golden on all sides. Juice two of the oranges. Set the juice aside, you should have more or less 150 ml/ 5 fl.oz/ 2/3 cup orange juice, you can top that with water if you don't have quite enough juice. Give two or three of the juiced orange halves into the cavity of the chicken. Place half of the thyme sprigs into the cavity as well. Bind the chicken legs together. Transfer the chicken to an ovenproof pot. Cut the remaining orange into wedges. Peel and cut the carrots into sticks, about 5 cm/ 2 inch long. Peel and cut the onions into wedges. Arrange the orange wedges, carrots and onions around the chicken in the pot. Season with salt and pepper and add the remaining thyme sprigs. Pour the freshly squeezed orange juice all around the chicken. Cover the pot and cook for 1 ½ hours or until the chicken juices run clear when you pierce the chicken into the thickest part of the thighs. The internal temperature measured with a meat thermometer should be of 73 degrees Celsius/ 165 degrees Fahrenheit. The vegetables should be tender as well. Baste the chicken with some of the cooking juices and sprinkle it with the sesame seeds. Return to the oven and cook, uncovered, for further 10 minutes. Transfer the chicken and the vegetables to a serving platter and keep warm. Let the chicken rest for 10-15 minutes before carving. Sieve the juices from the pot into a small pan and bring to a boil. In the meantime whisk together the cornstarch with 1-2 tablespoons cold water until you obtain a thick yet pourable paste. Slowly pour the cornstarch paste into the simmering gravy while whisking continuously. Let bubble once or twice and remove from the heat. Carve the chicken and serve immediately as suggested above. 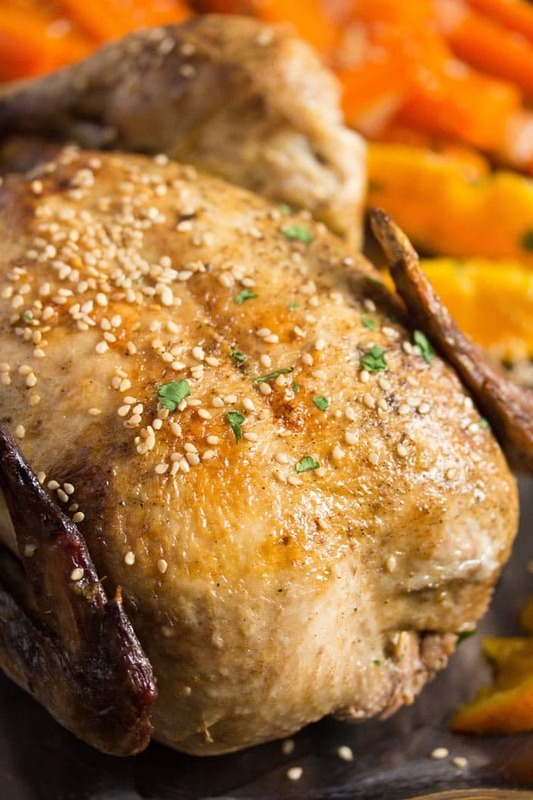 I love whole roasted chicken, but actually haven’t baked one with citrus. Can’t wait to try it! I hear you! I love chicken too. While I’m trying to cut down on overall meat intake, I can’t commit to being a vegetarian or vegan 🙂 Orange and chicken are great combinations too!